Since 2000, LANDAUER have adopted the use of the OSL (Optically Stimulated Luminescence) technology for assessing personal dose in particular with Luxel+®. OSL has been developed using material manufactured by LANDAUER to its own specifications: aluminium oxide doped with carbon (Al2O3:C). Within a number of materials, the electrons and holes produced during radiation exposure can become trapped at crystal defects. These remain stored until they are excited, or stimulated, from these traps giving rise to optical emission. The intensity of the optical emission is a function of the radiation exposure and the method/intensity of the stimulation. If the trapped charges are excited by thermal stimulation (thermoluminescence) then most of them are released and any record of the radiation exposure is lost. However, if the trapped charges are optically stimulated, only a small fraction of the trapped charge is released. 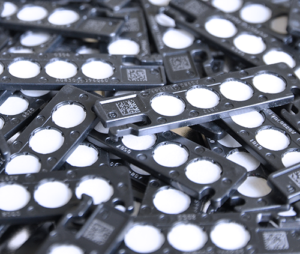 The process is optimised by the frequency of the stimulating light, the characteristics of the photomultiplier used to detect the emitted light, and the material used as the OSL detector. During readout, only a small fraction of the trapped charges are released. Therefore, much of the trapped charge is retained following stimulation and may be released in subsequent stimulations. This enables OSL dosemeters to be read out many times without significant lost of signal. As its detectors, LANDAUER use aluminium oxide doped with carbon (Al2O3:C). The aluminium oxide, Al2O3:C, used in our dosemeters is produced at the LANDAUER Crystal Growth Facility in Stillwater, USA. Al2O3:C (corundum or sapphire) is used primarily because of its high sensitivity to radiation, 40 – 60 times that of LiF (TLD-100). It has a principal emission peak at 410 – 420 nm (blue). It also has excellent properties for radiation dosimetry, including linear response up to 50 Gy. Al2O3:C powder is obtained by grinding crystals and sifting the powder to the desired size range. This powder is mixed with a polyester binder and coated onto a roll of polystyrene film. The aluminium oxide layer is approximately 0.2 mm thick sandwiched between polyester foils 0.03 mm thick (top) and 0.1 mm thick (bottom). Each reel of detector material received by LANDAUER is assessed for suitability by stringent quality assurance testing. The sensitivity of the material is printed on the top of the detector strip. possibility to re-analysis the dosemeters as very little of the signal is lost in each read. better control over the amount of luminescence emitted. The aluminium oxide is not affected by heat or moisture.